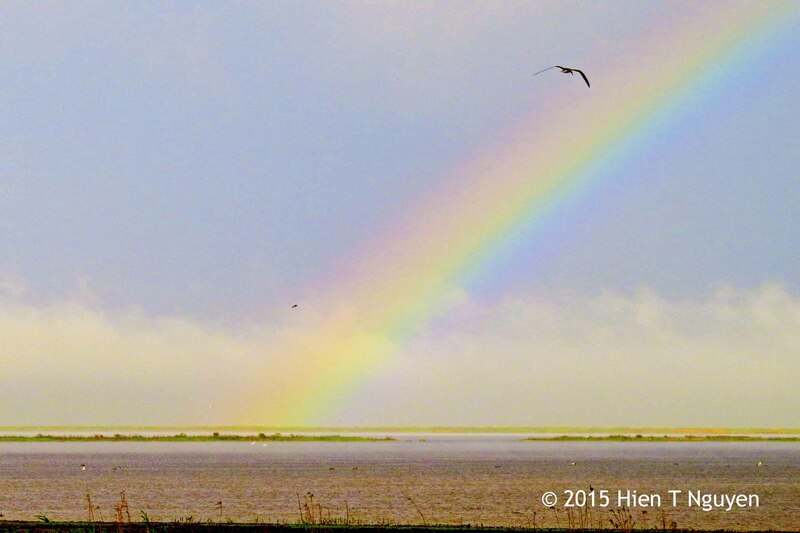 We are entering a week when it is going to rain every day. 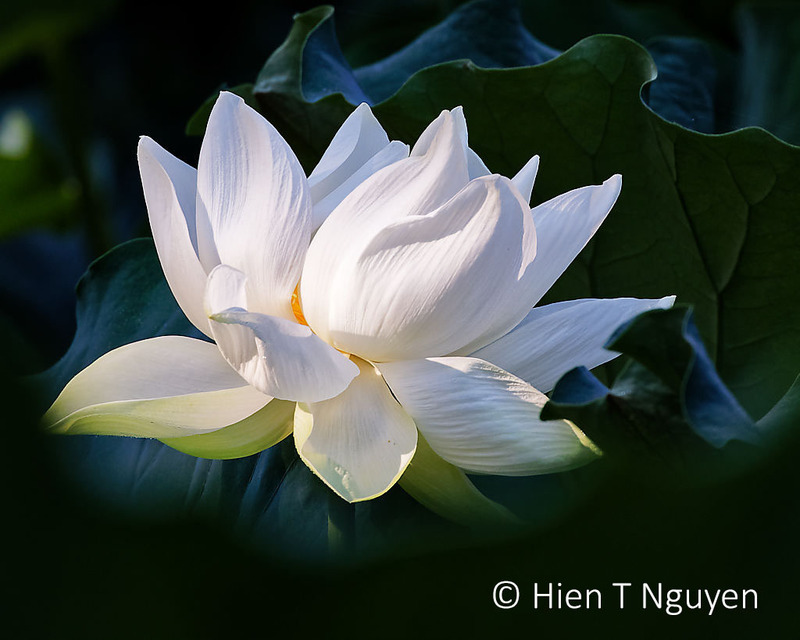 Yesterday morning, however, the sun was out and I arrived at the Lotus pond in time to see the first rays of sun fall on the flowers. 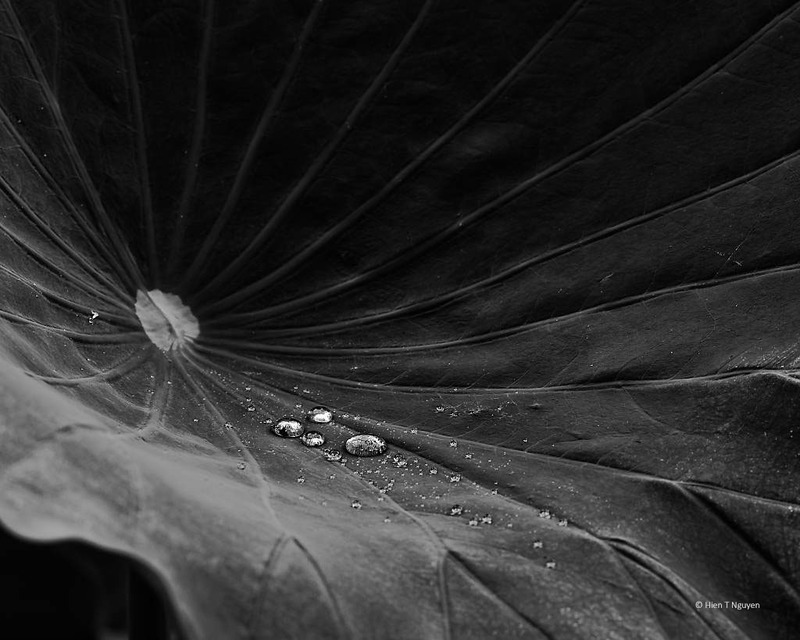 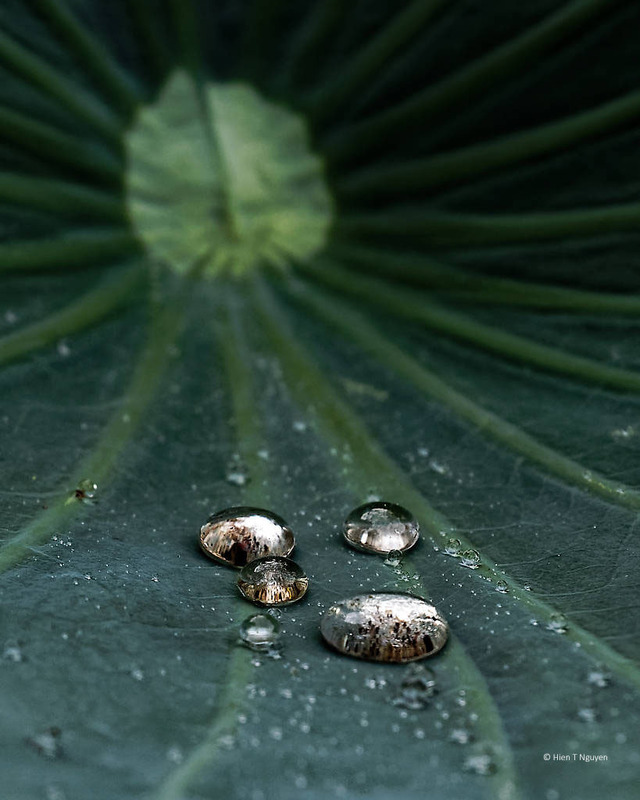 Water beads on Lotus leaf. 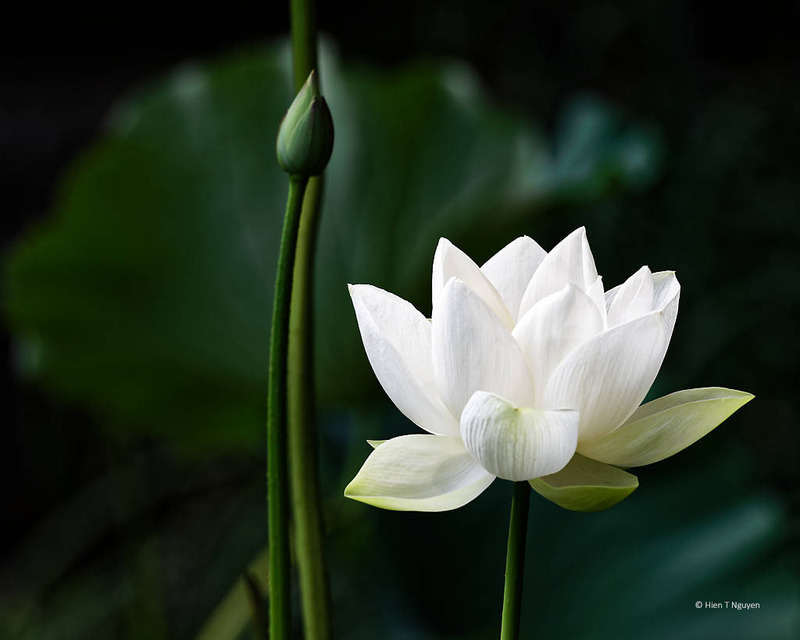 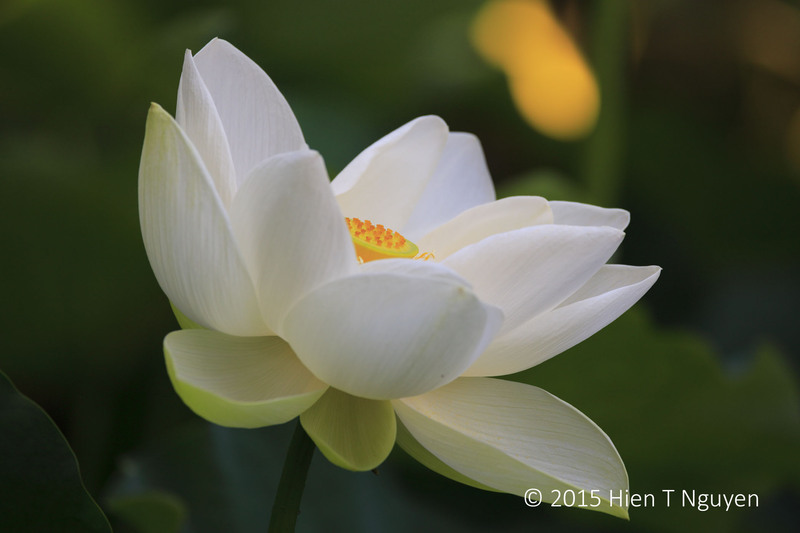 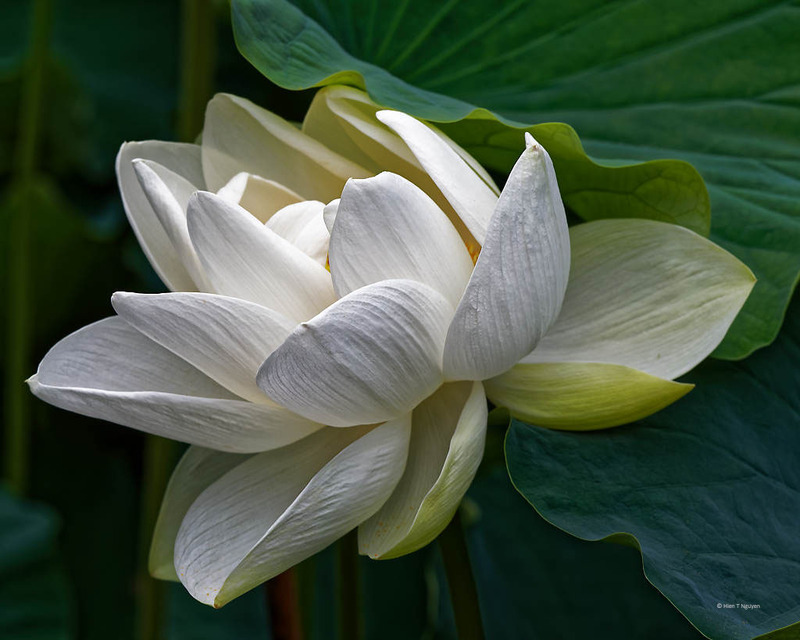 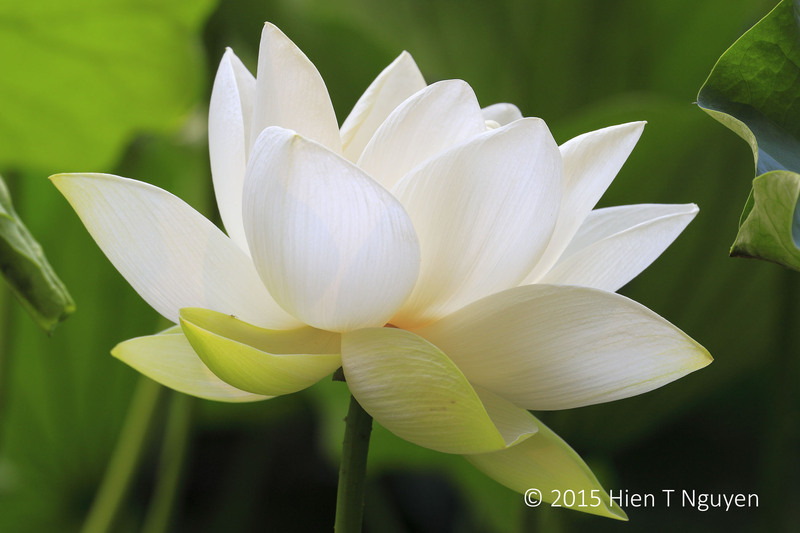 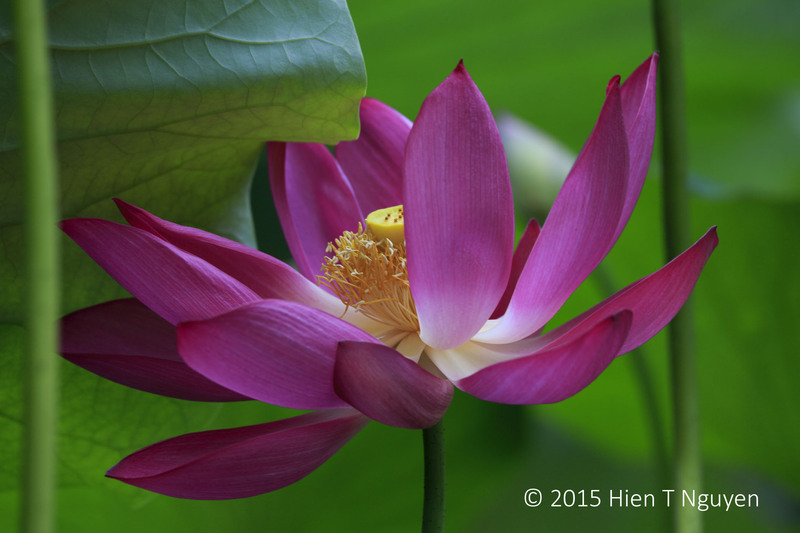 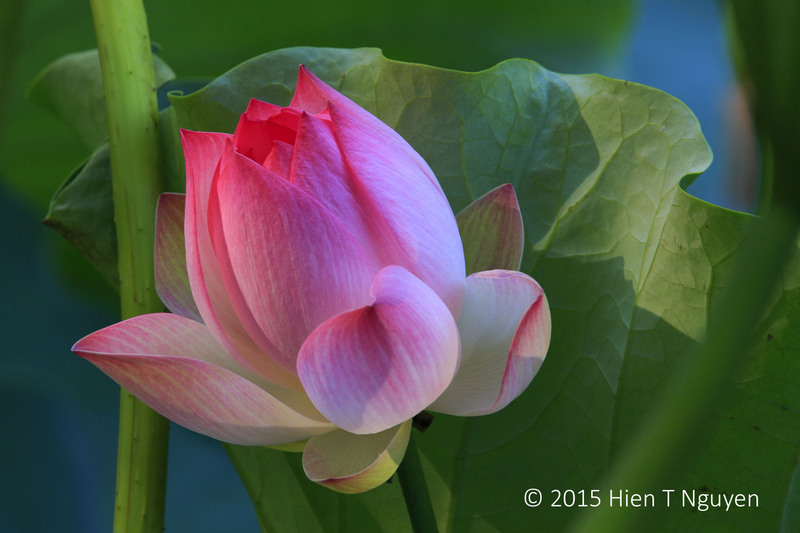 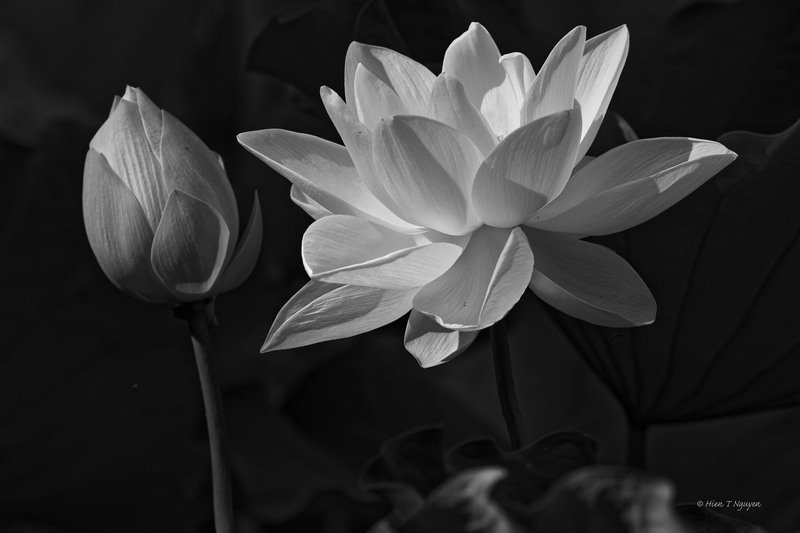 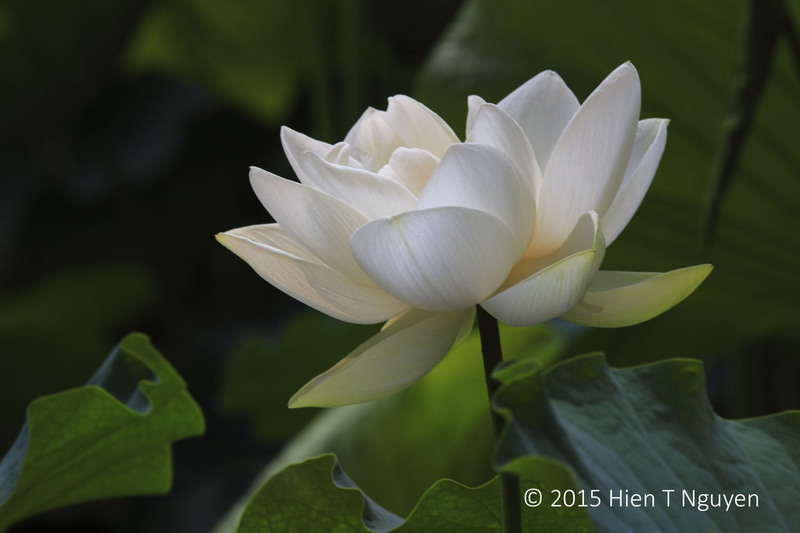 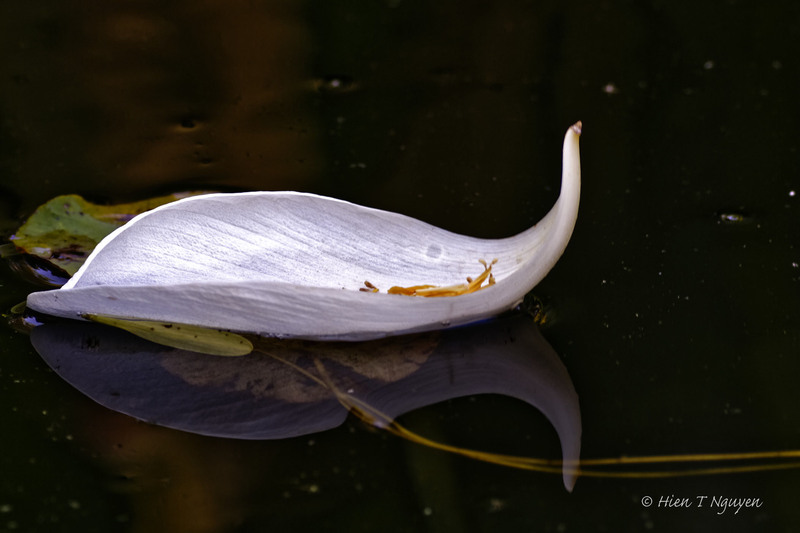 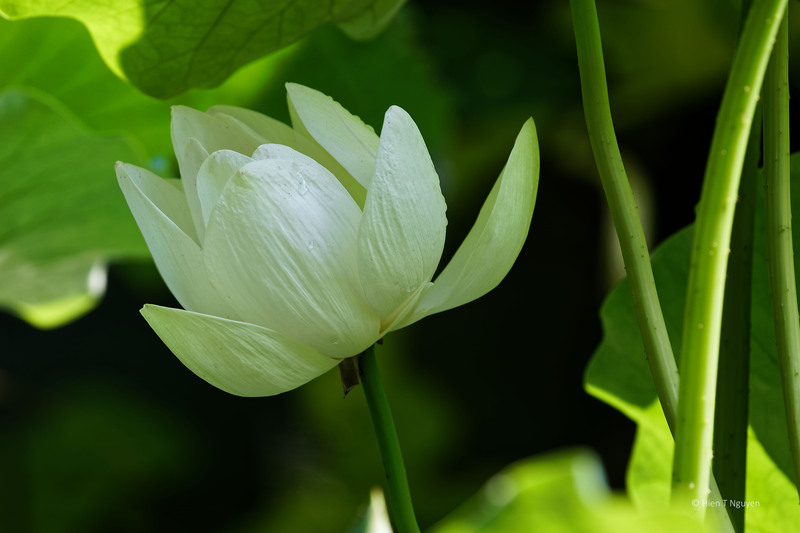 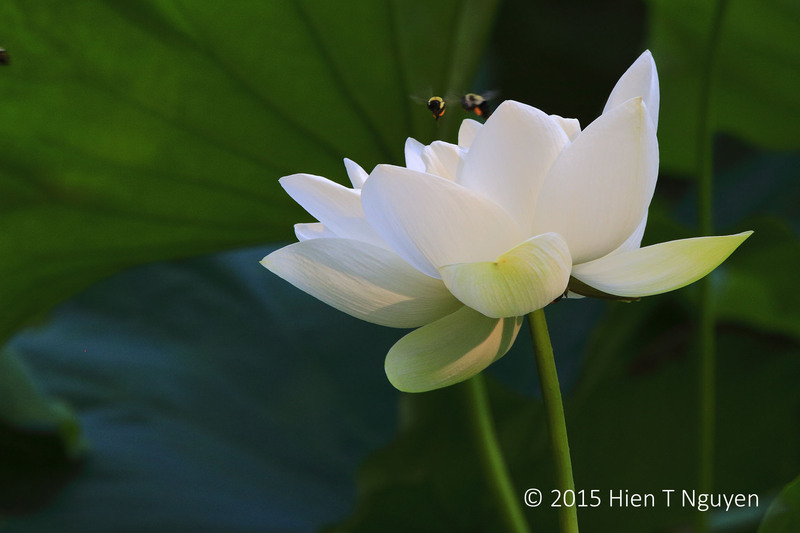 Here are some pictures of Lotus flowers taken yesterday at the pond near our house. 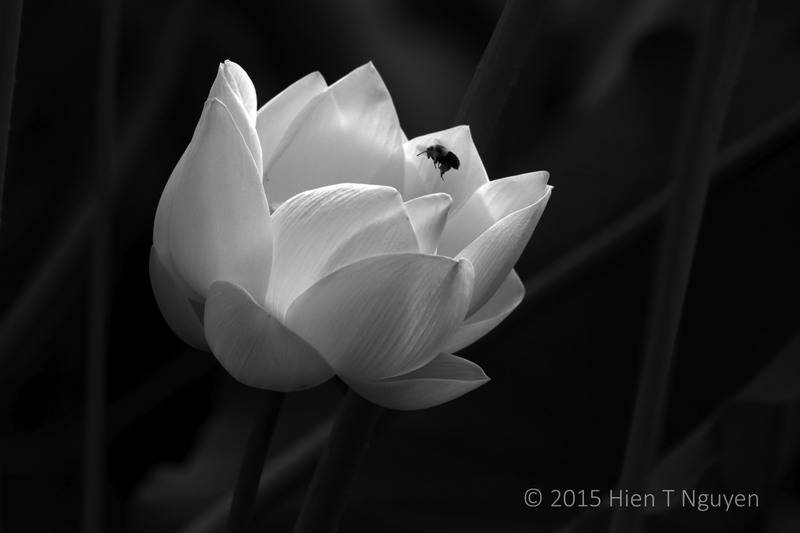 Sisyphus, in this case a bee holding up a Lotus flower. 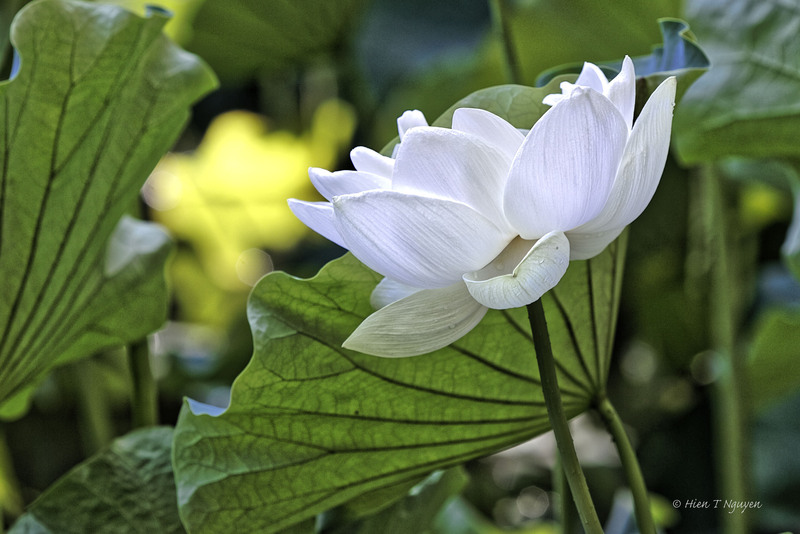 White Lotus framed by a nearby leaf. 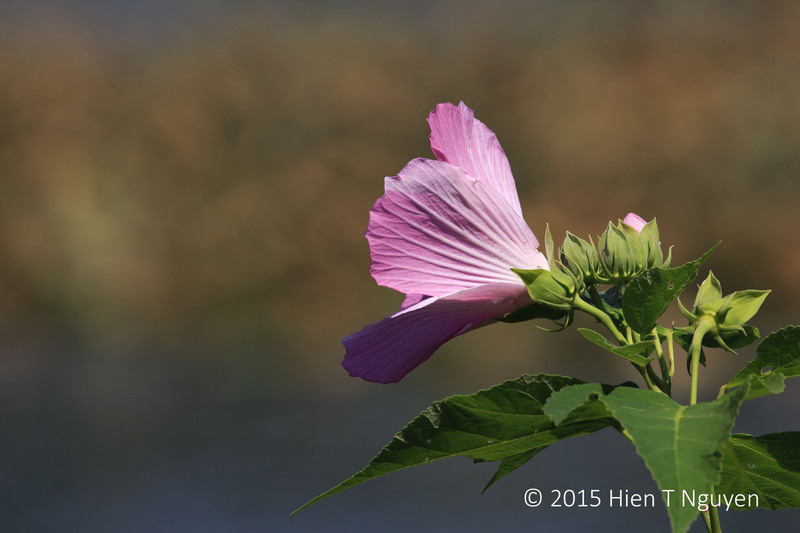 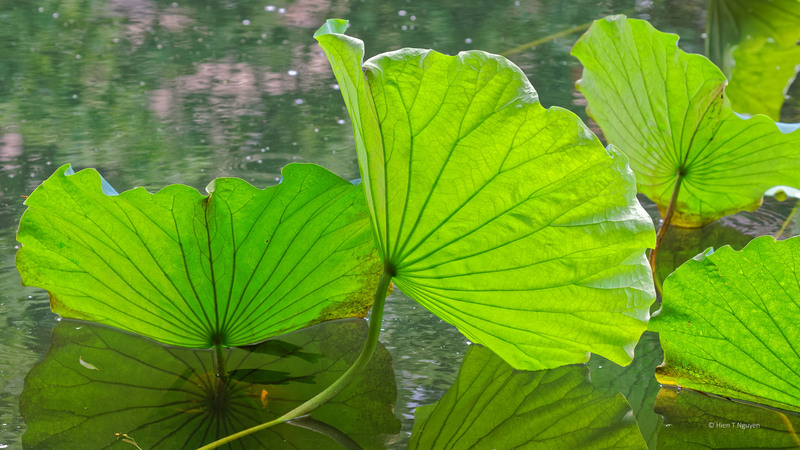 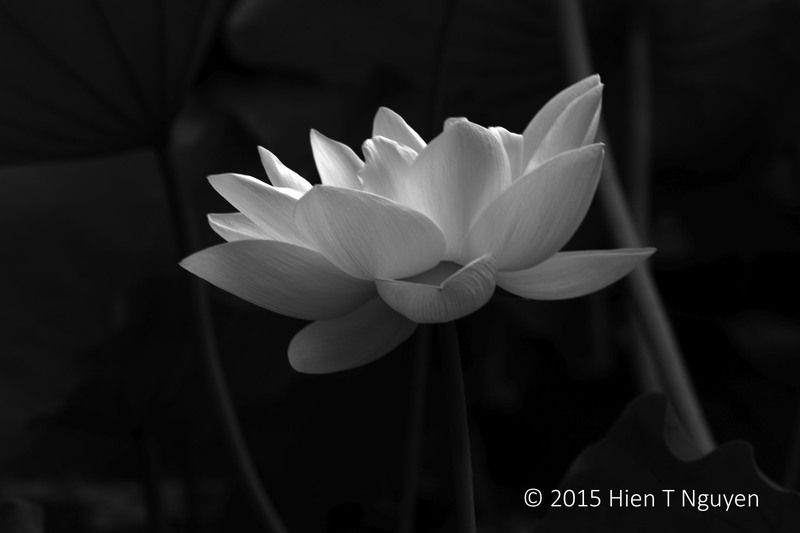 Today I took a quick trip to the lotus pond in early morning, when it was still not too hot. 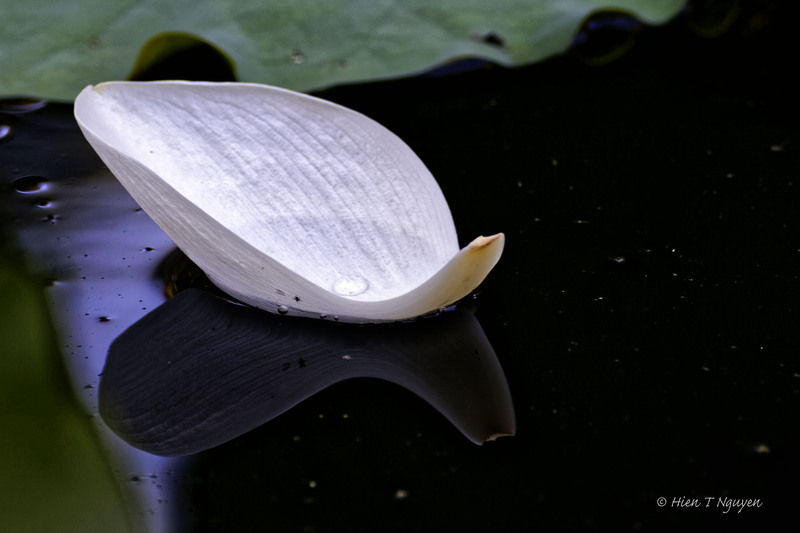 The flowers were mostly gone, with fewer than a dozen left, like this one below. 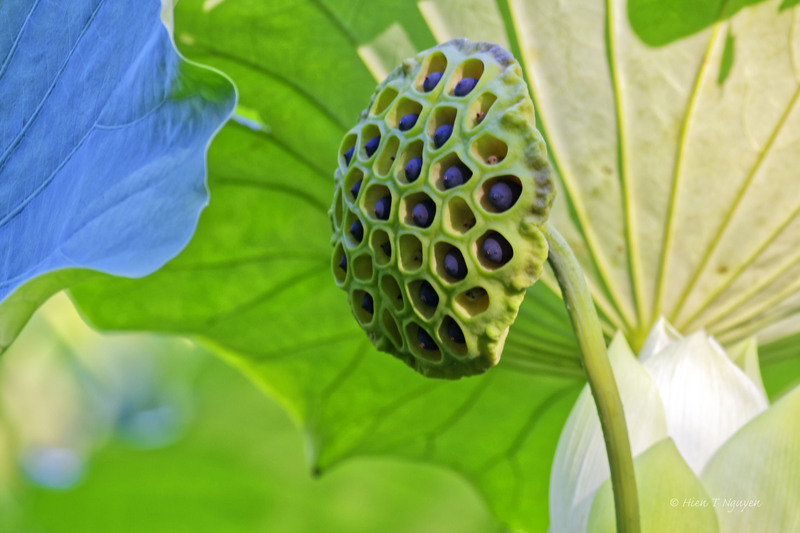 There were many pods, some filled with large seeds, right next to flower buds still trying to bloom. 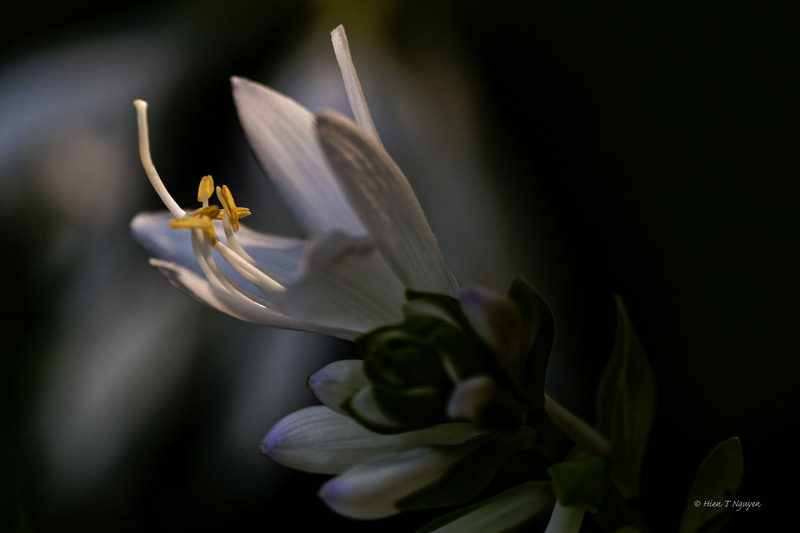 Nearby, in deep shade, hosta flowers were in full bloom. 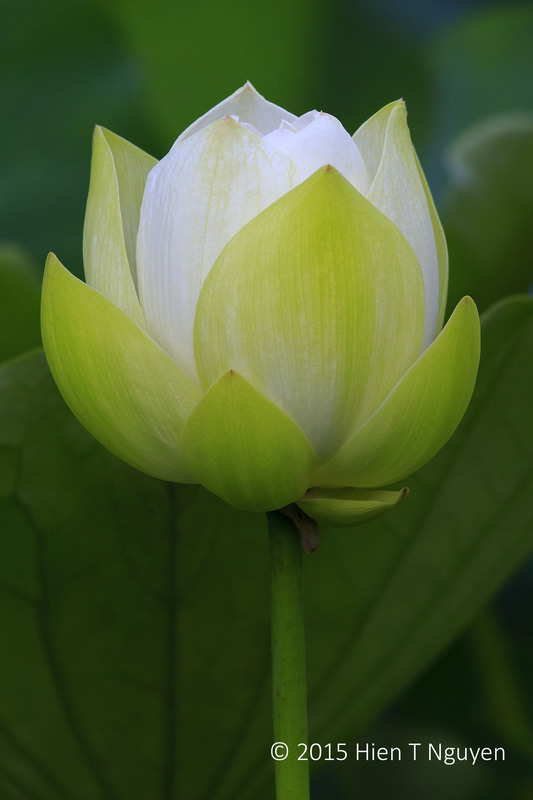 The buds were white and a pale lavender at the tips. 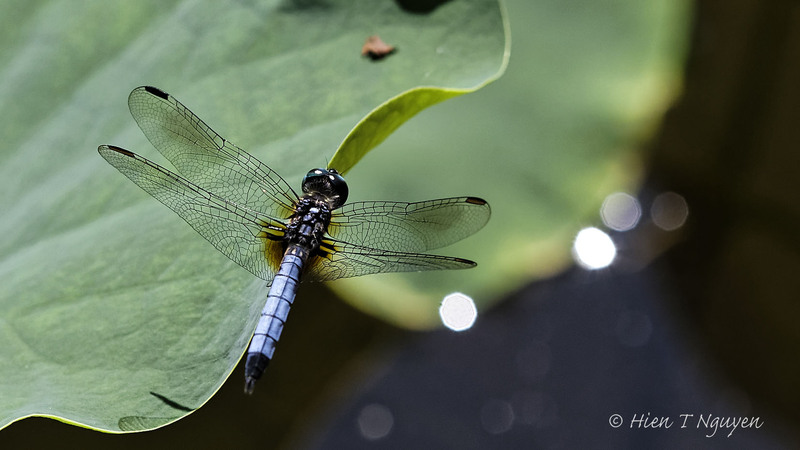 Finally, the dragonflies were as plentiful as ever. 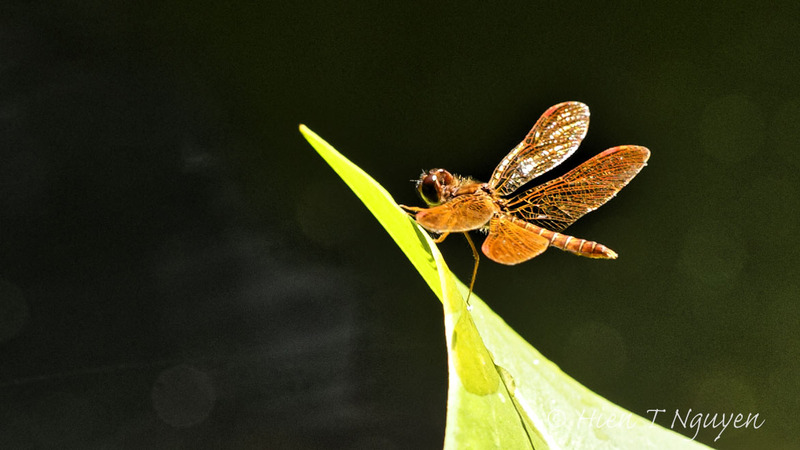 I tried to snap a few shots of some that were flying and buzzing around from end of the pond to the other, but nothing came out well. 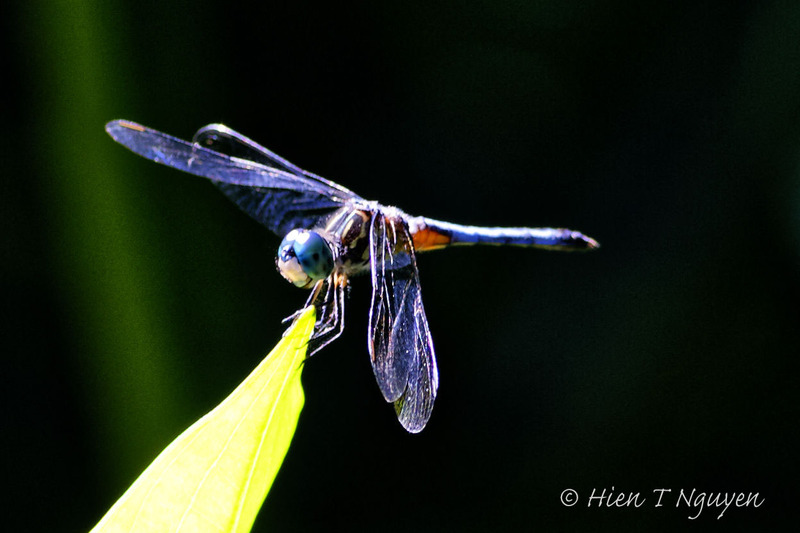 Finally, I had to settle for a stationery Blue Dasher basking in the warm sun. 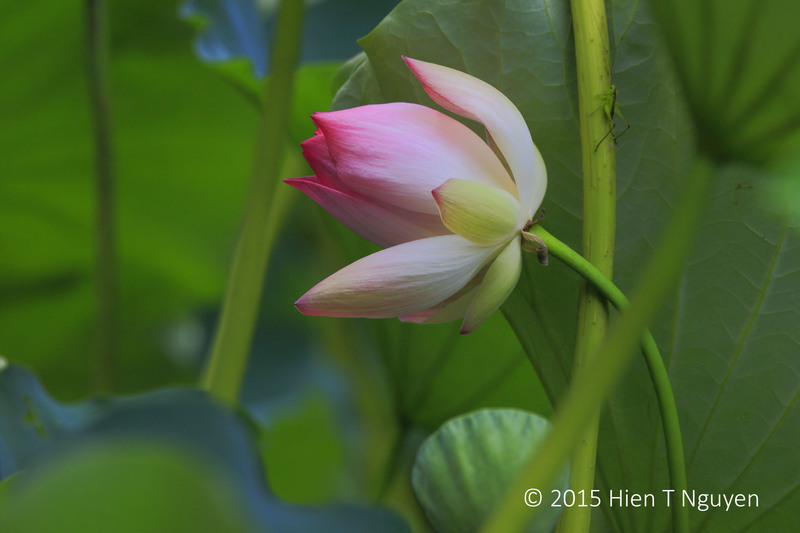 It’s been a month since my last trip to the lotus pond. 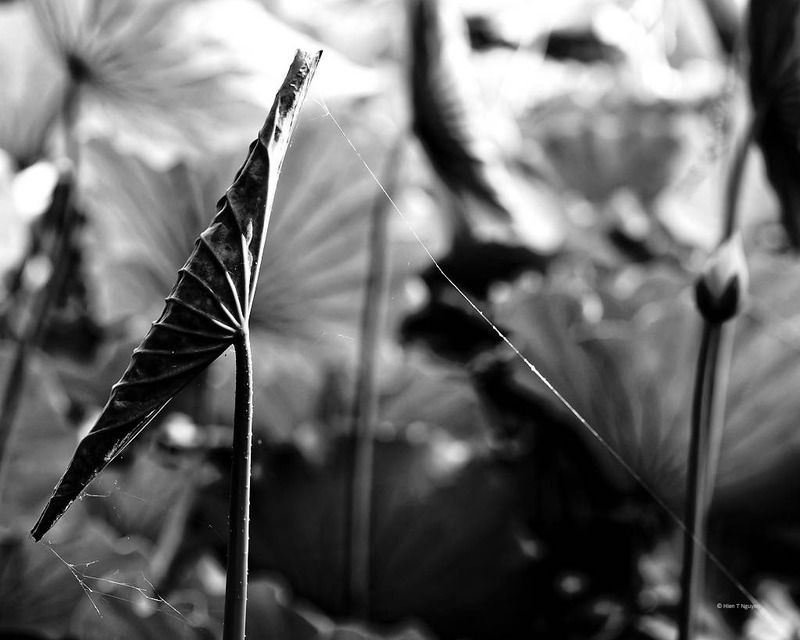 I’ve been meaning to go back and take more pictures, but haven’t done so yet, mainly because it’s been so hot. 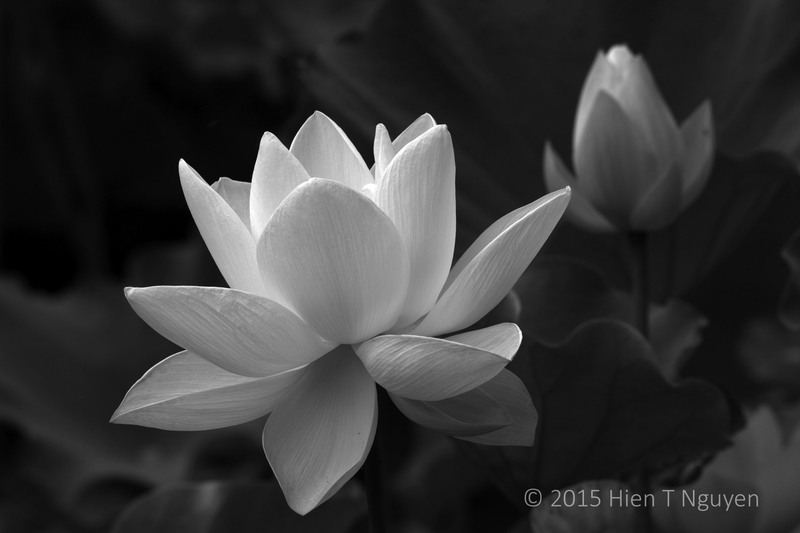 The following photo is a monochrome version of a shot taken last month. 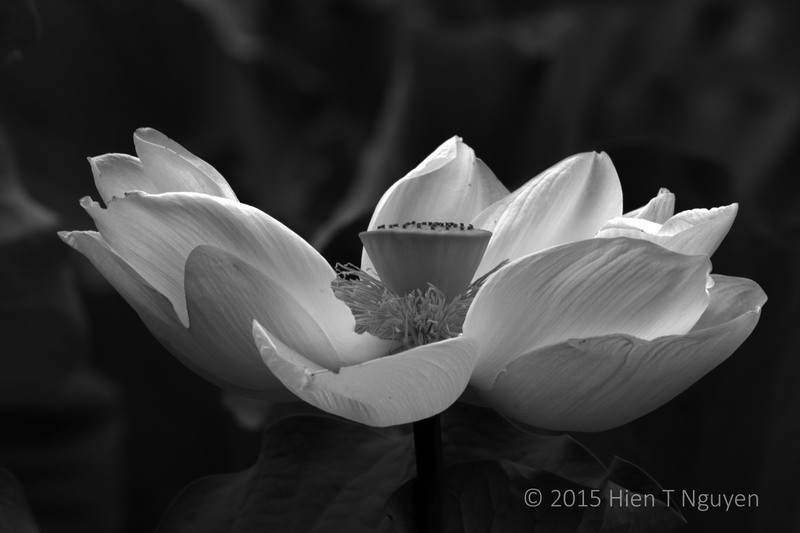 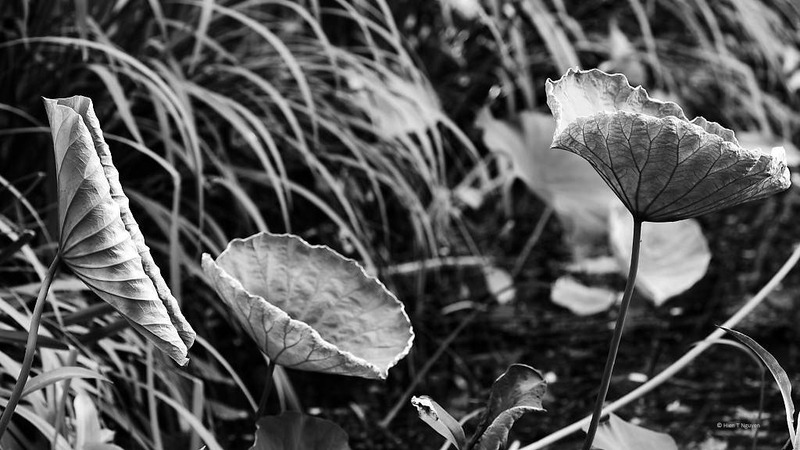 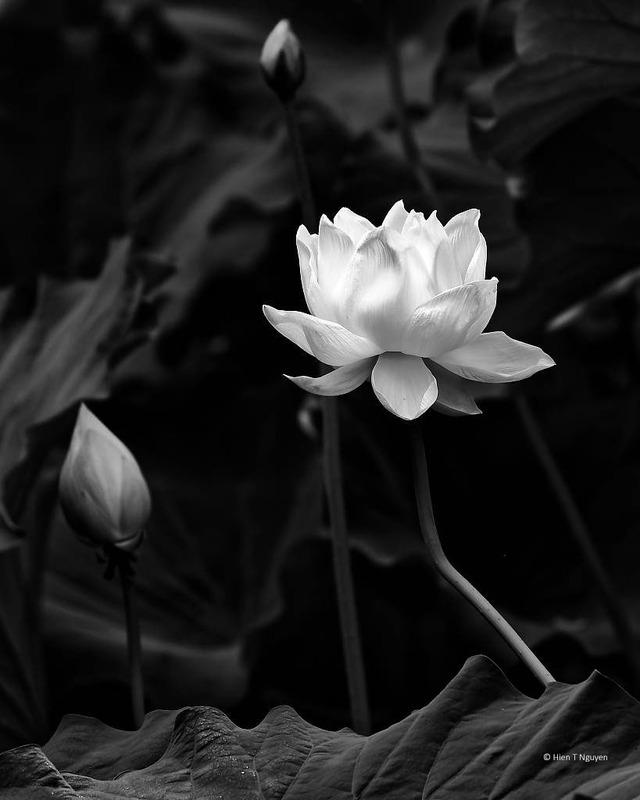 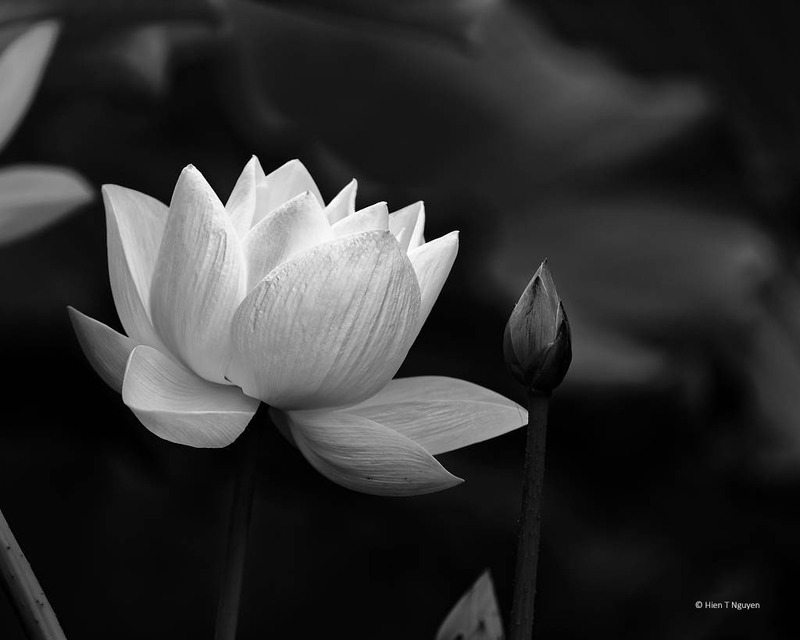 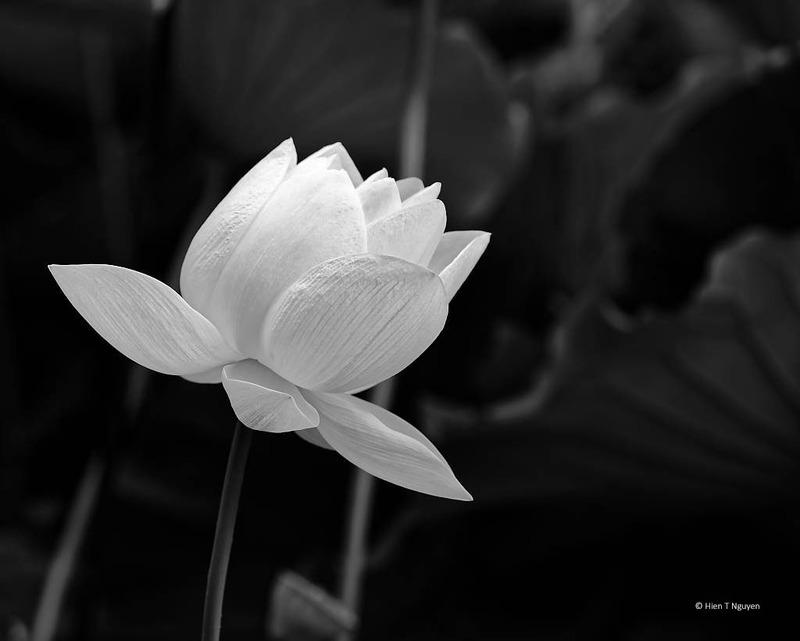 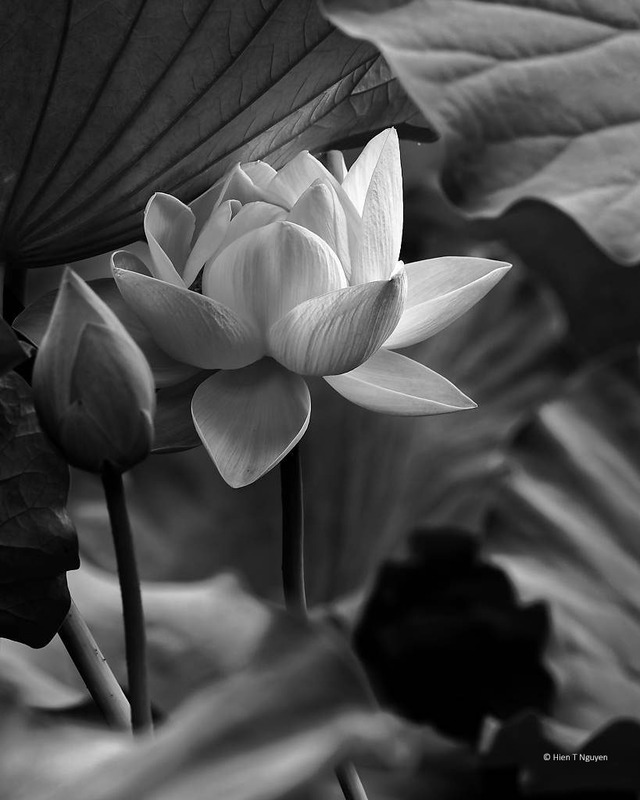 Since the flower is white, it lends itself easily to this b&w treatment. 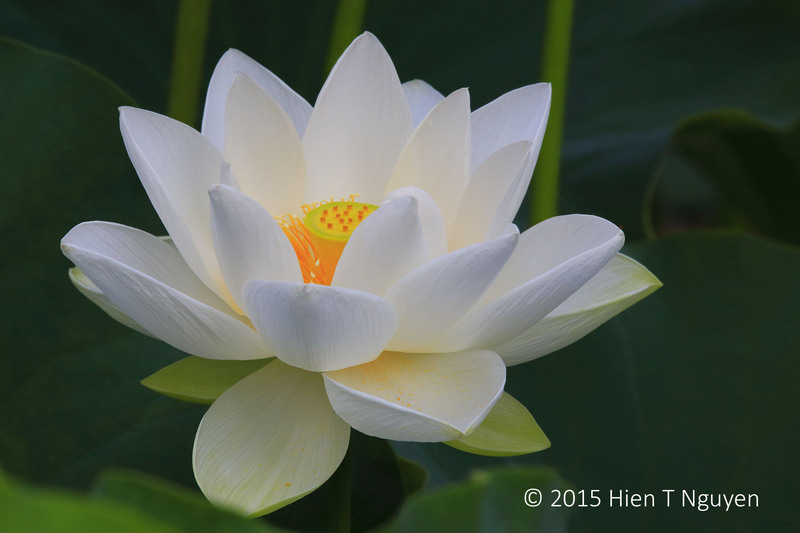 At the height of summer, a trip to the lotus pond near our home has become an annual event for me. 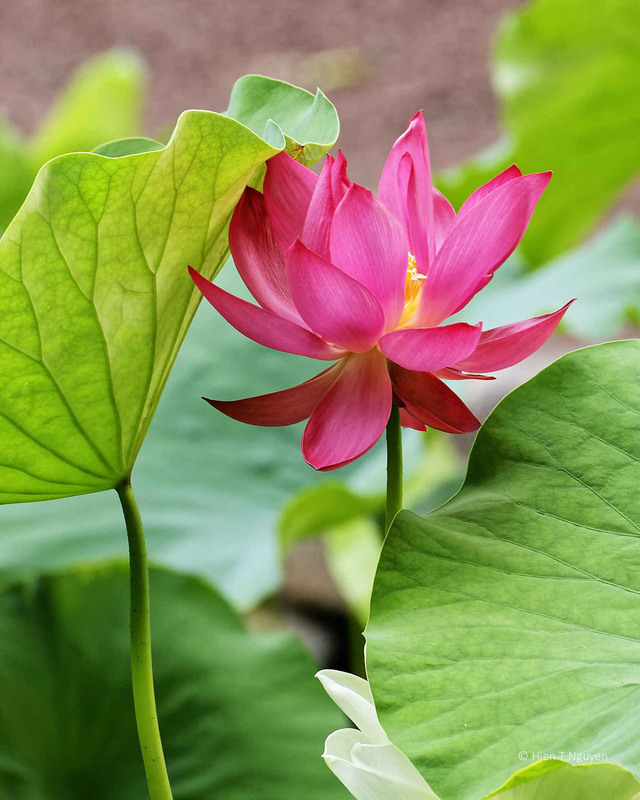 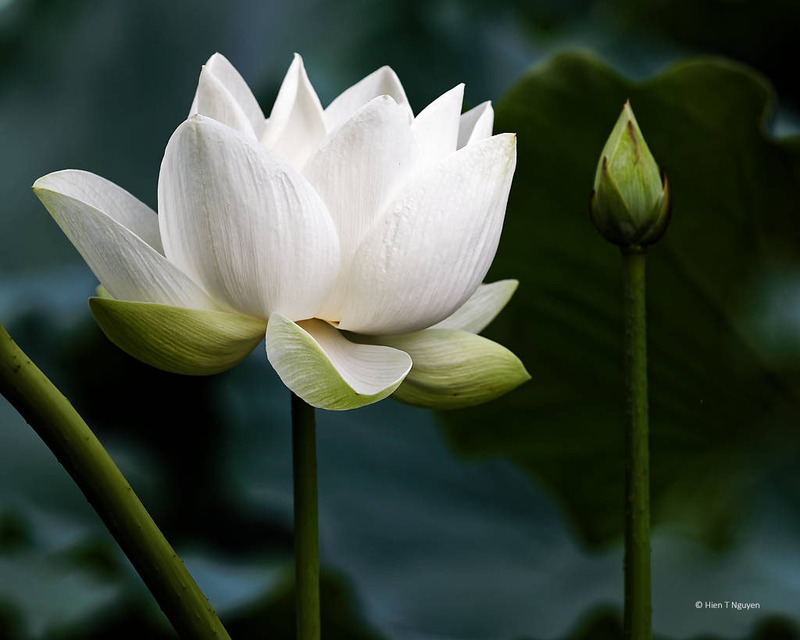 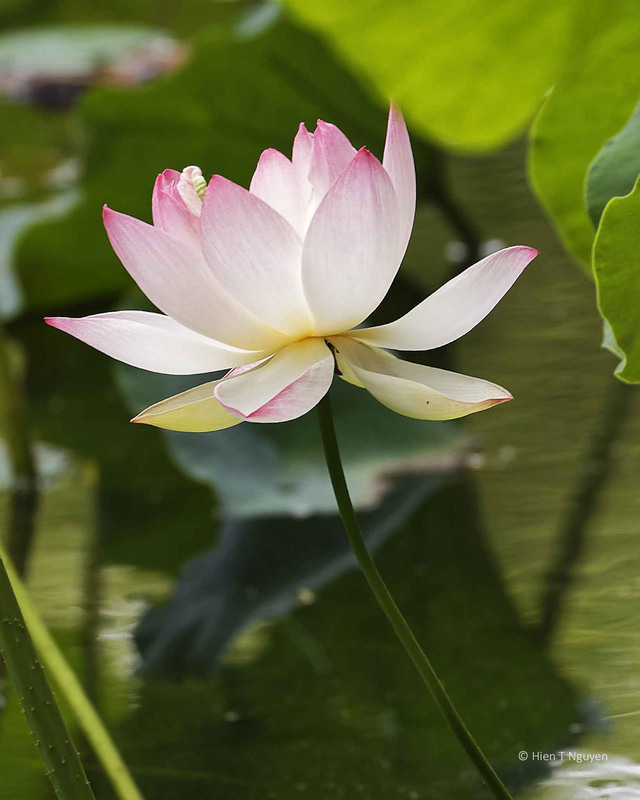 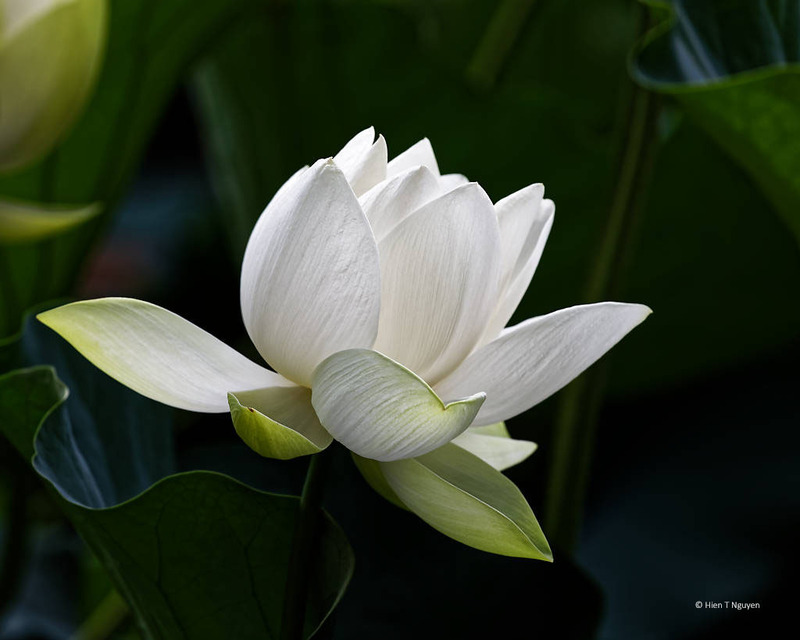 The pond is not too large but well maintained, endowed with many white and pink lotus flowers. 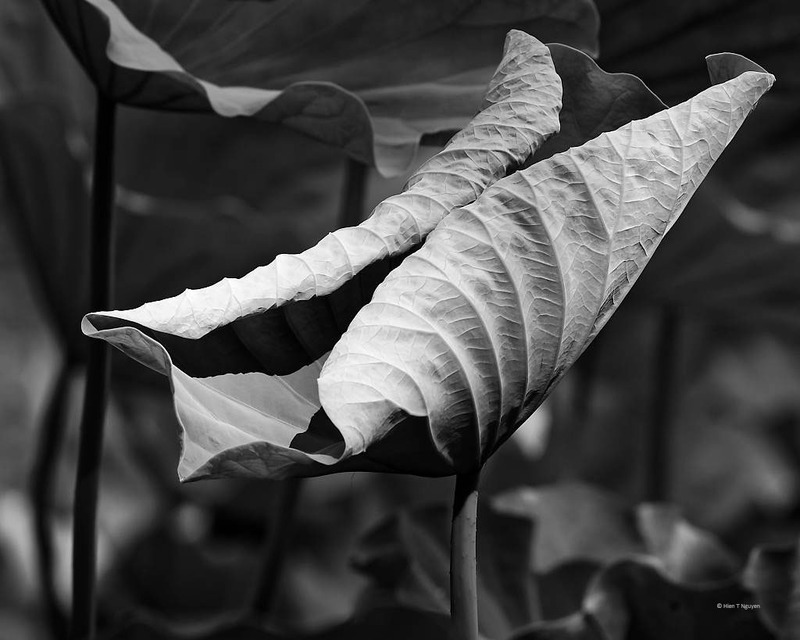 There are plenty of shade trees around it to protect photographers from the sun and the heat. 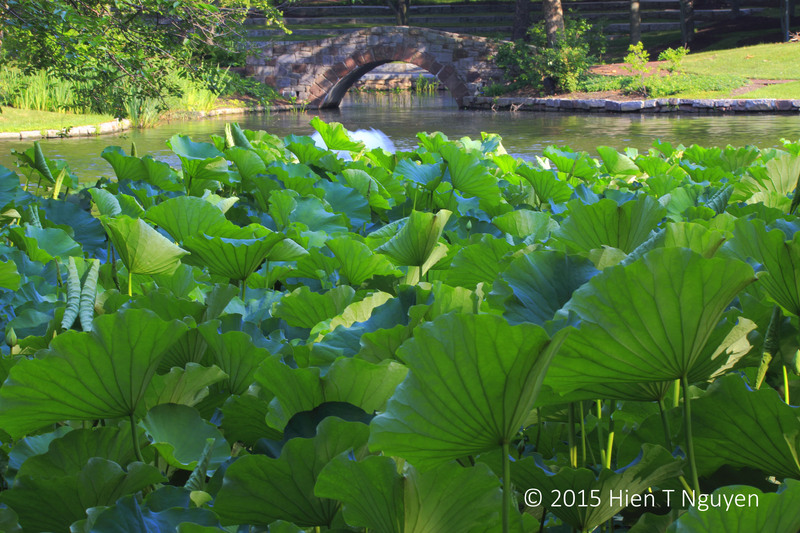 This morning, at the golden hour I went there and “owned” the pond for a half hour before others arrived. 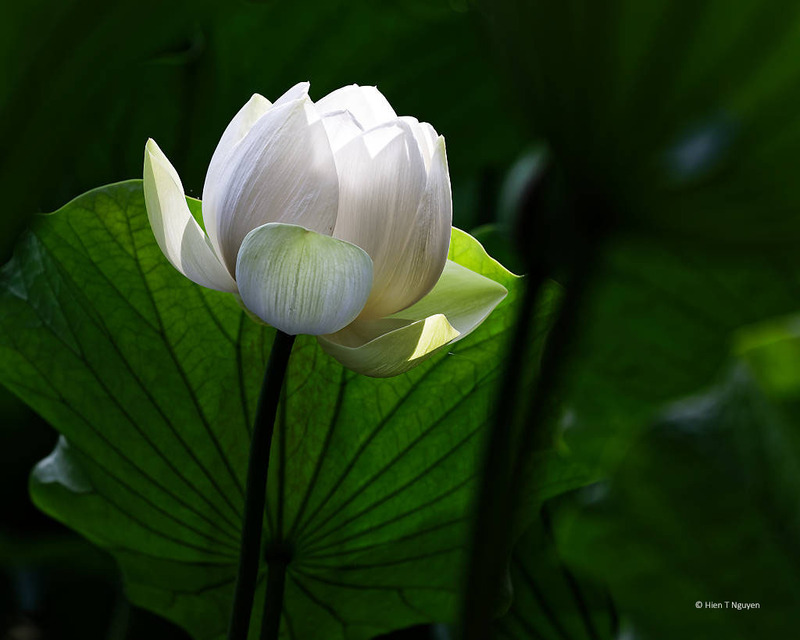 All of the flowers were white, as the pink ones usually bloom as much as two weeks later. 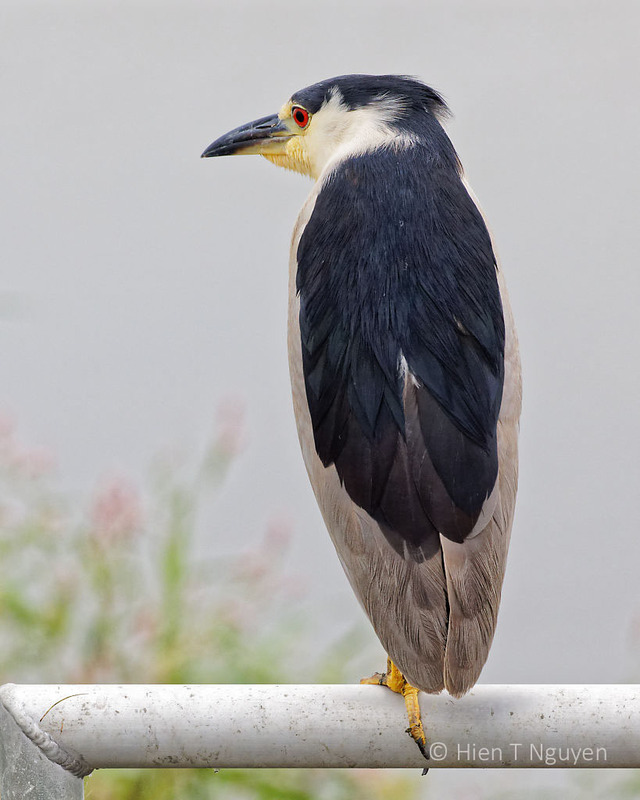 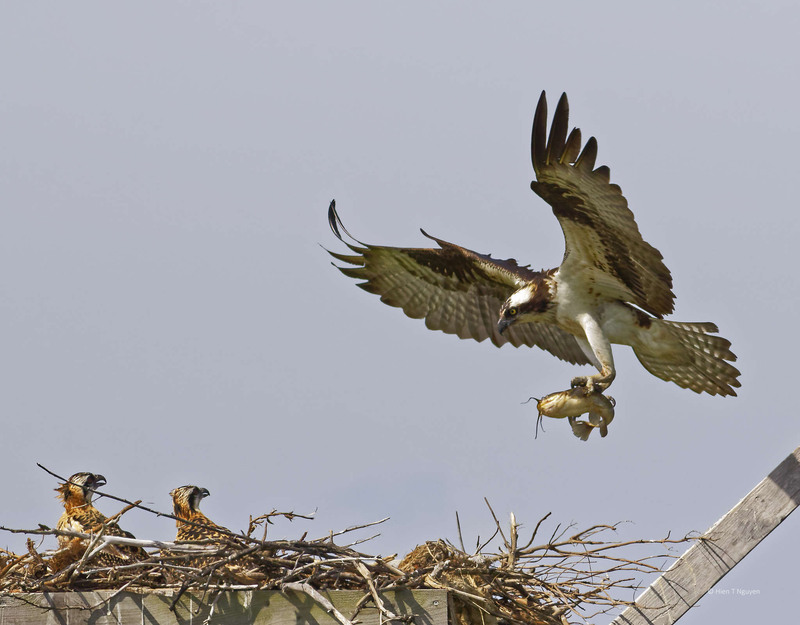 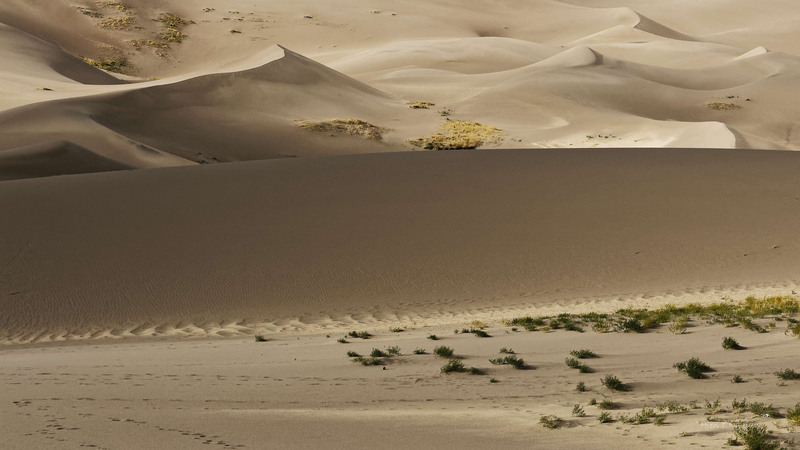 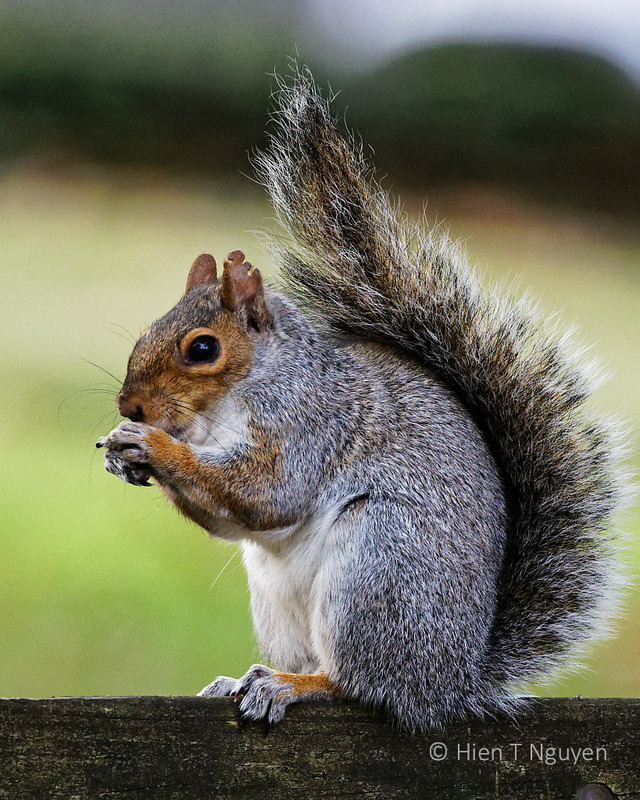 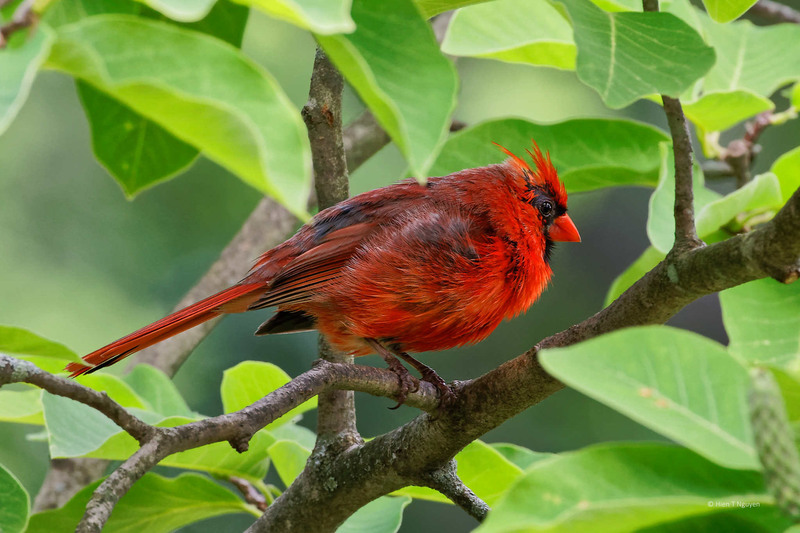 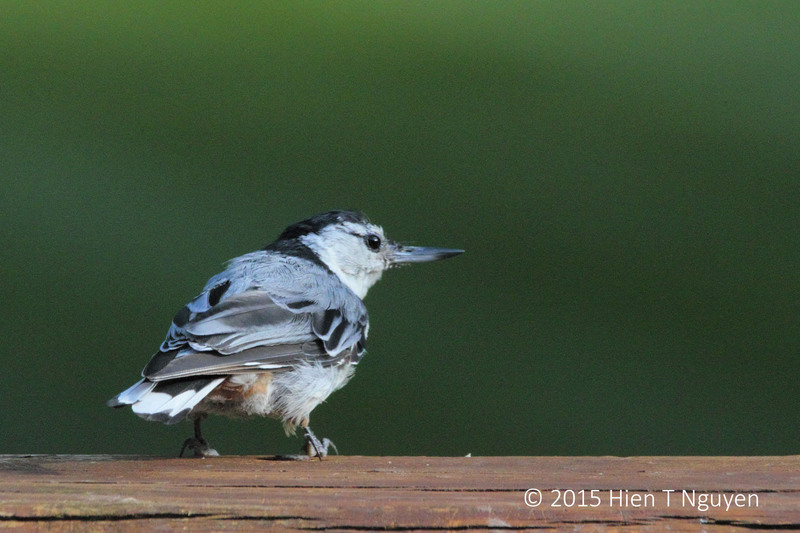 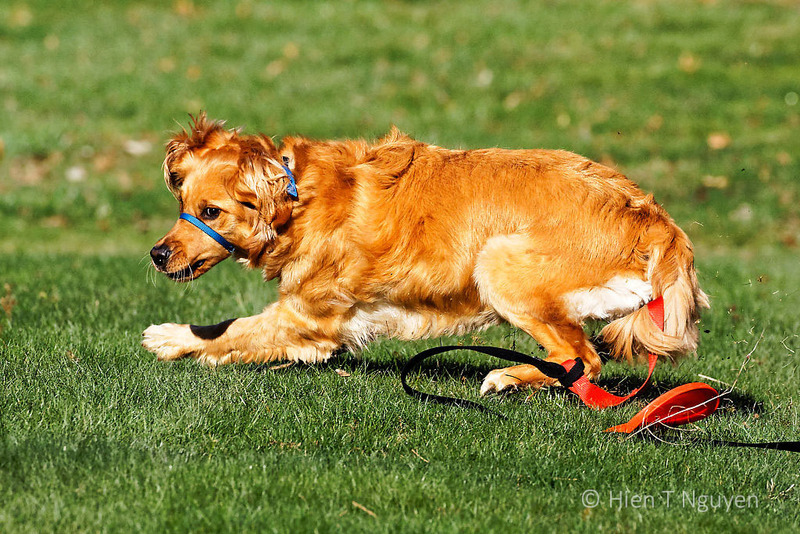 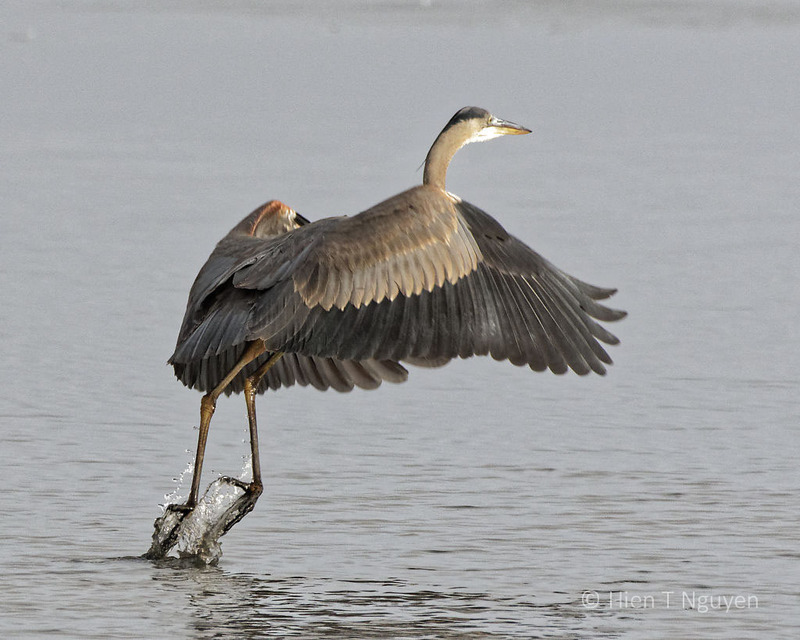 For the following photos I used two Canon lenses: a 180 mm macro lens and a 400 mm lens, both reputed to be among the sharpest lenses with excellent colors. 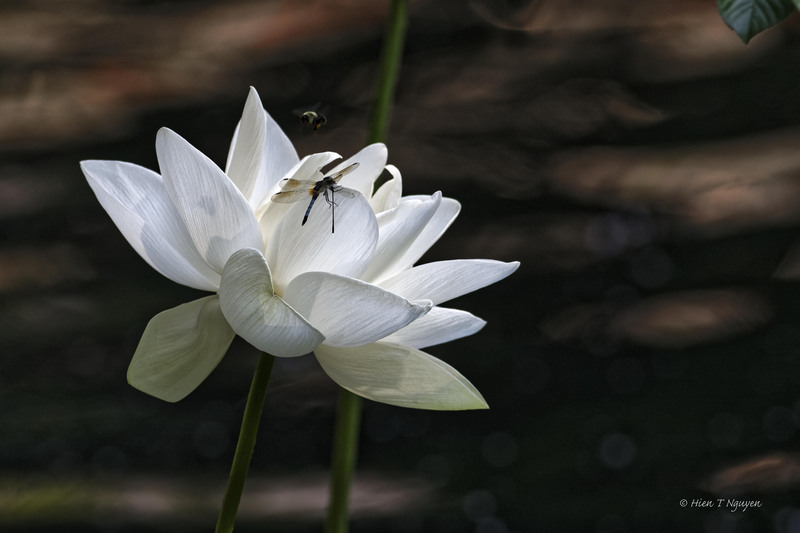 Lotus with a dragonfly clinging to it, and a bee hovering above it. 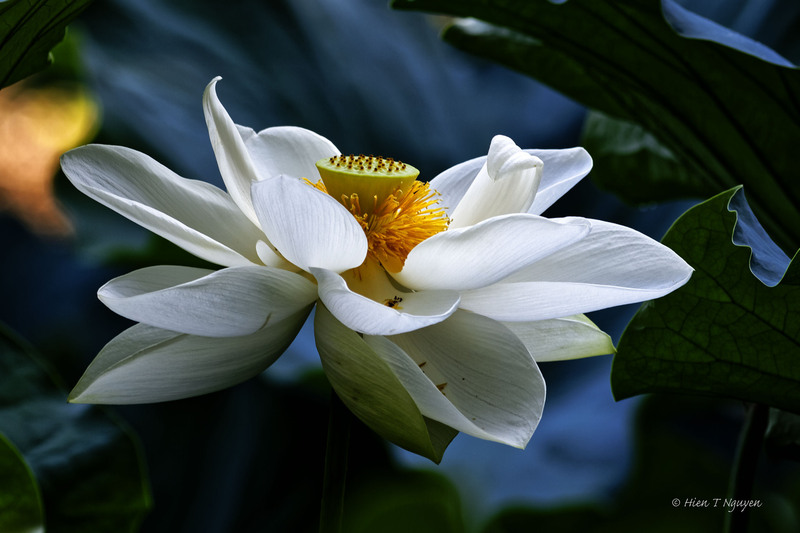 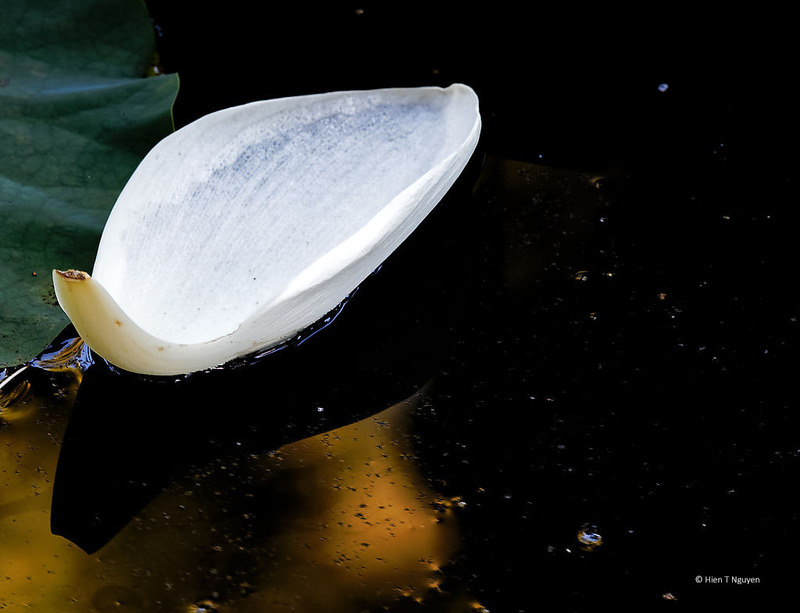 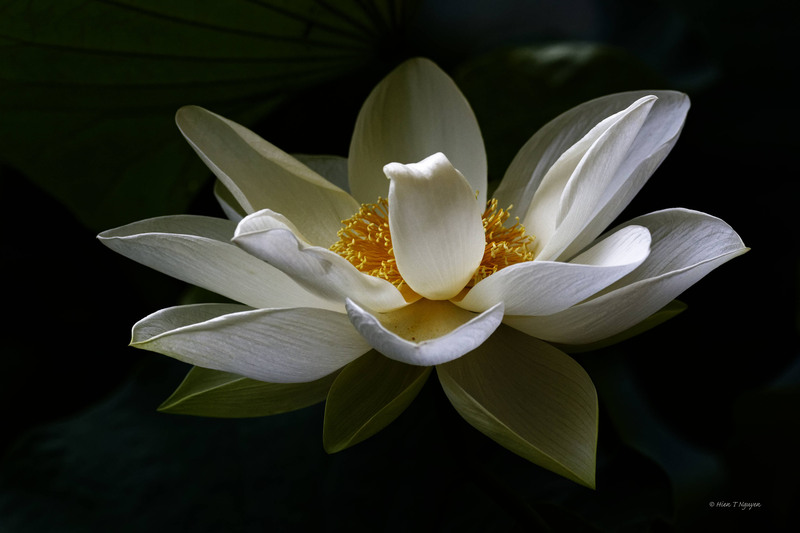 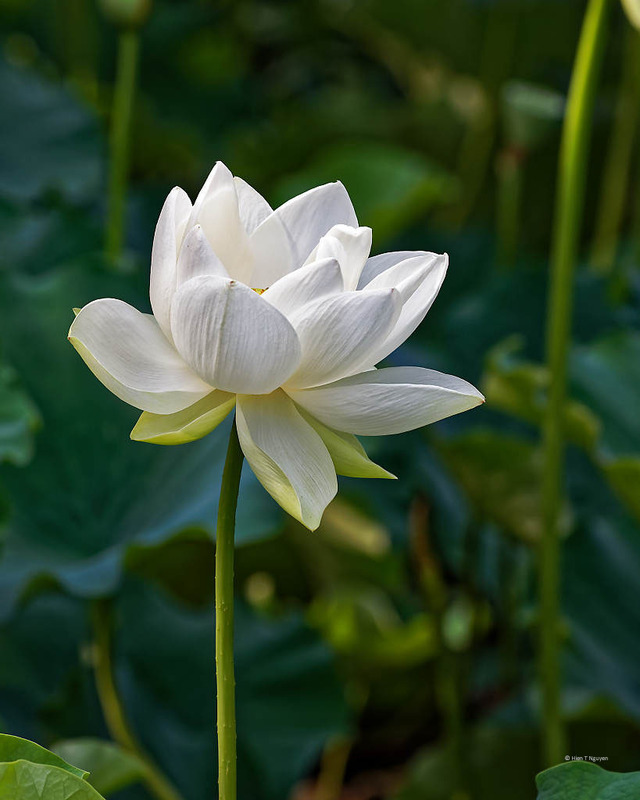 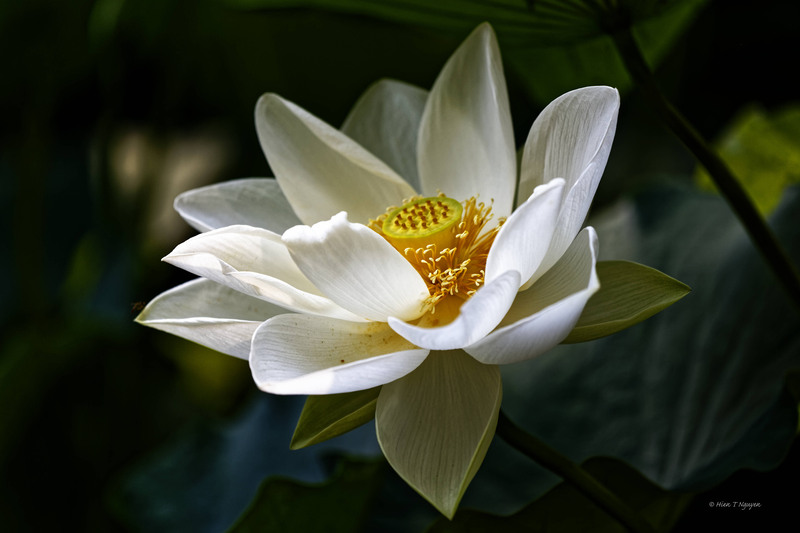 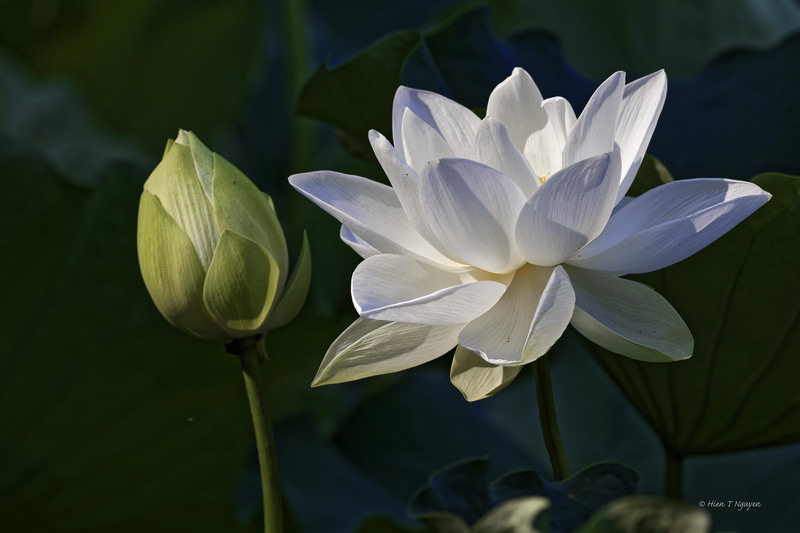 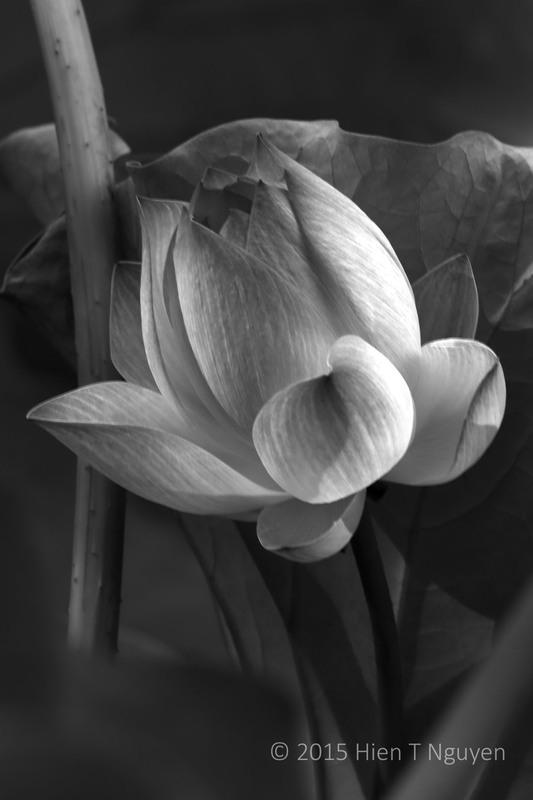 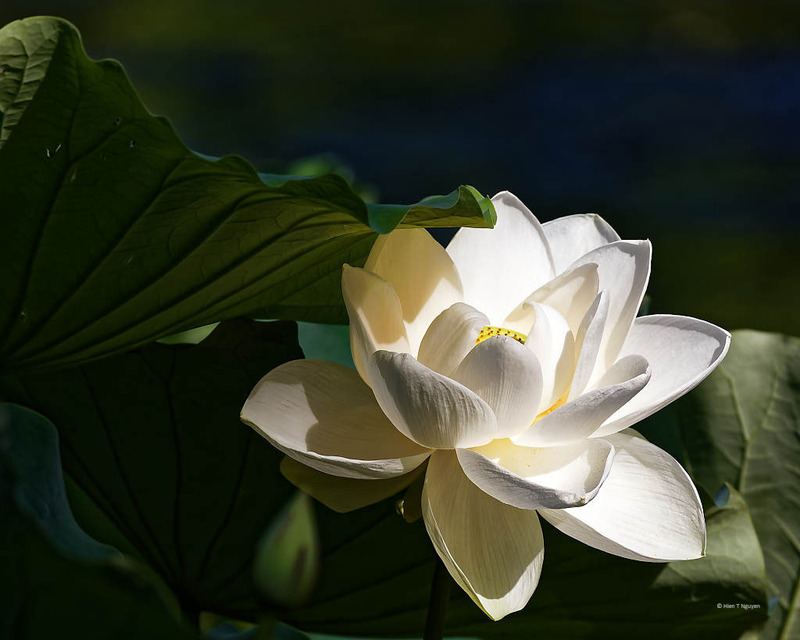 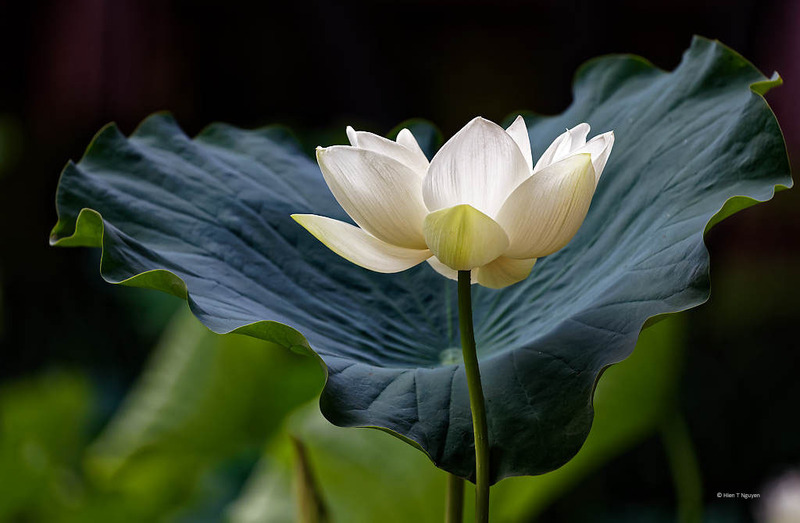 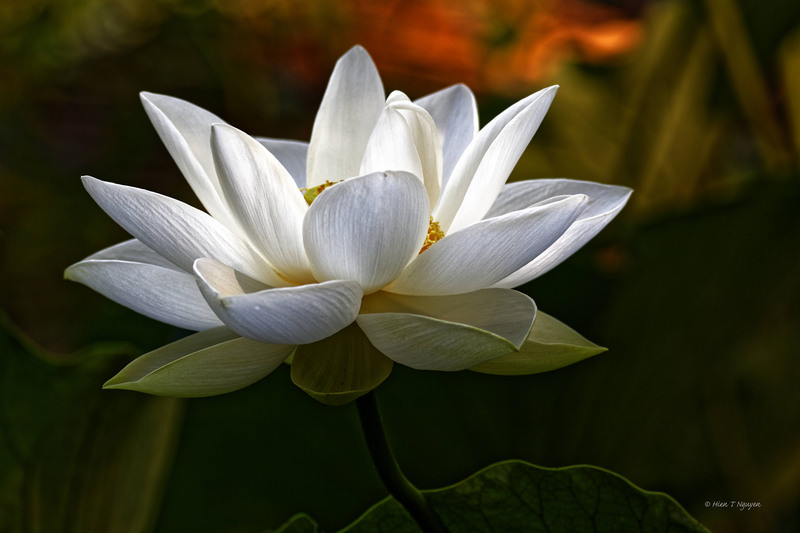 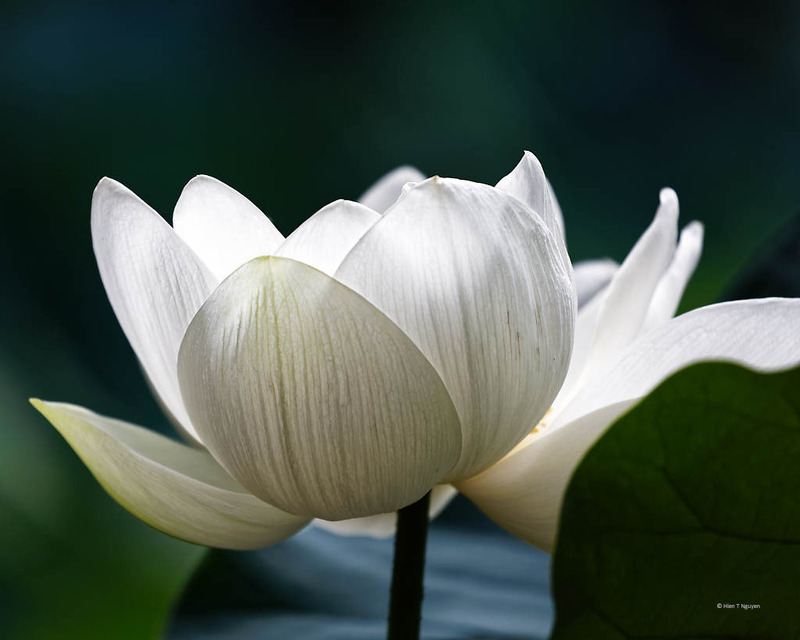 White Lotus, with reflections of red and orange flowers in background. 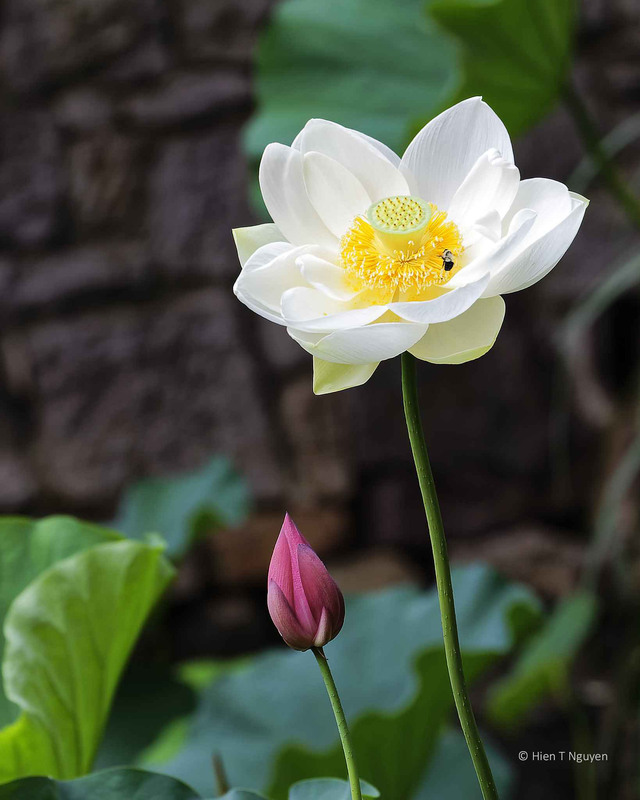 The Lotus flowers have started to bloom. 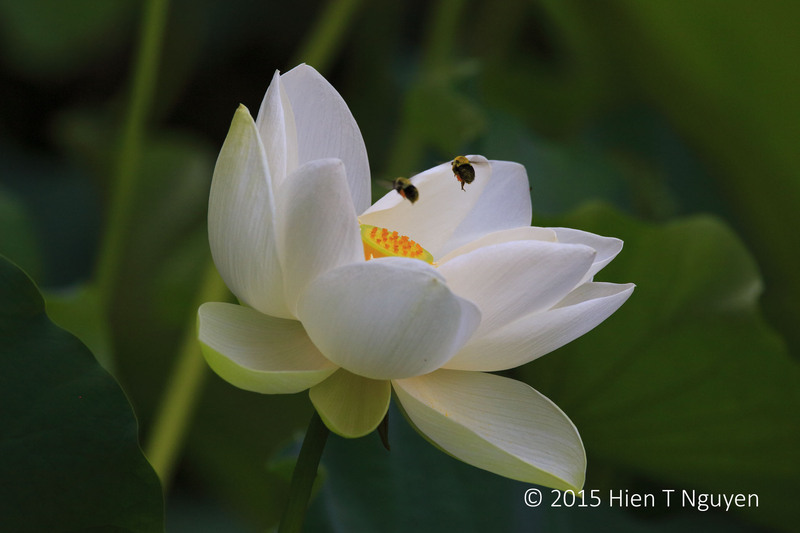 This morning there were only two flowers that had opened up, but I still managed to take quite a few shots, especially with bees and dragonflies hovering and flitting near them. 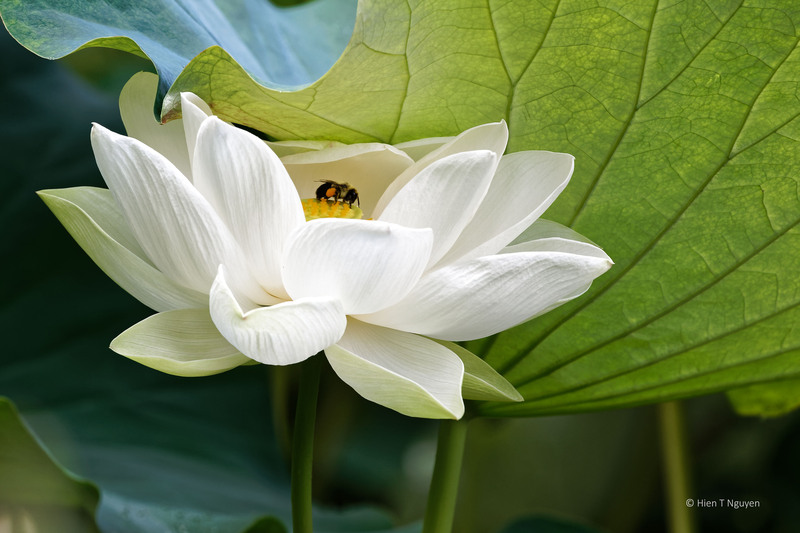 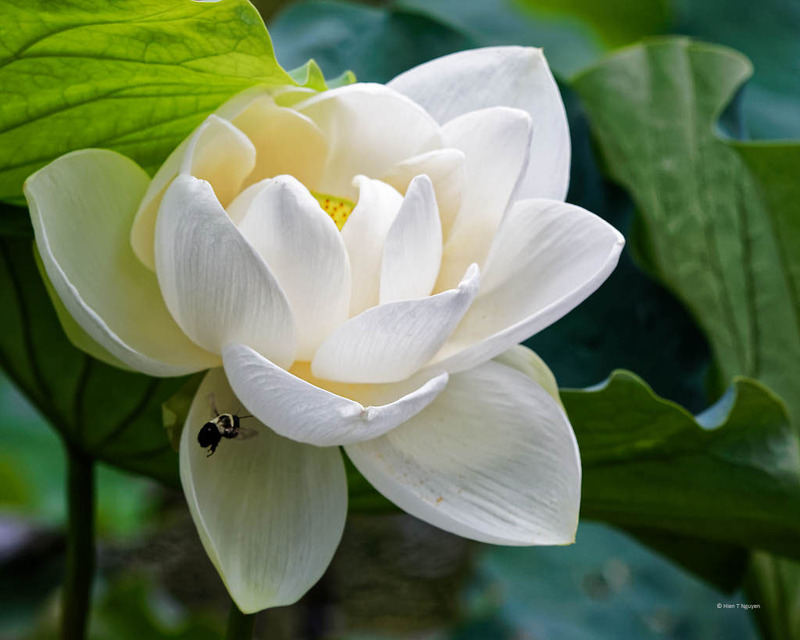 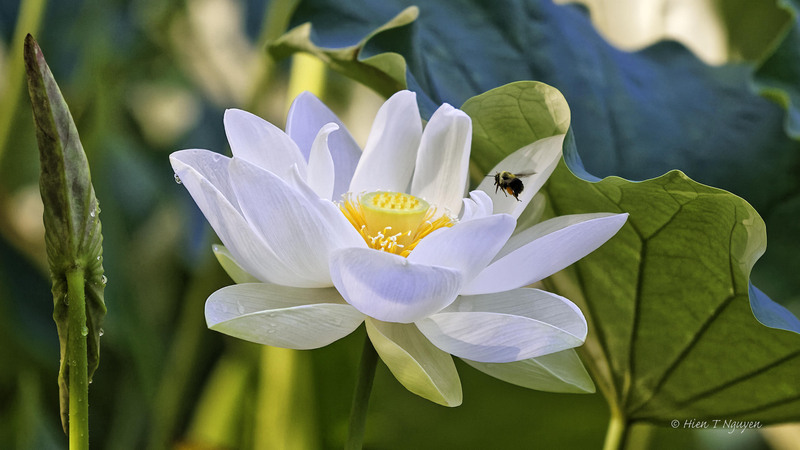 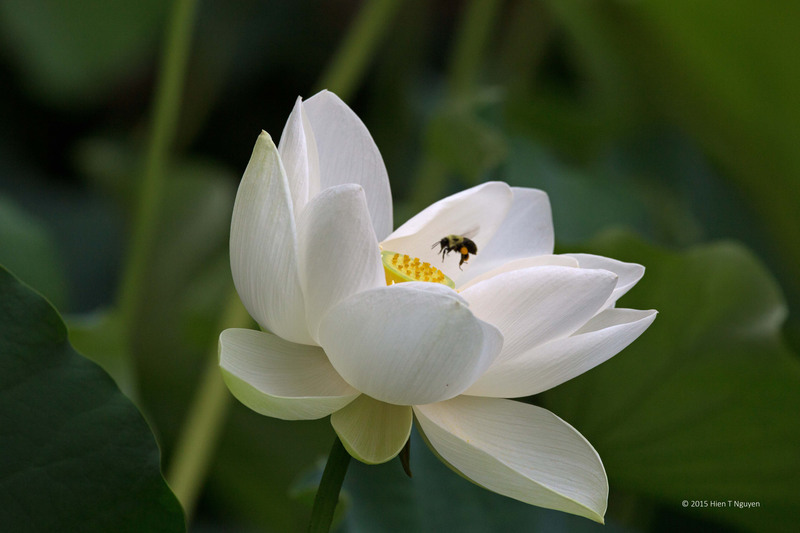 Bee aiming for core of Lotus flower. 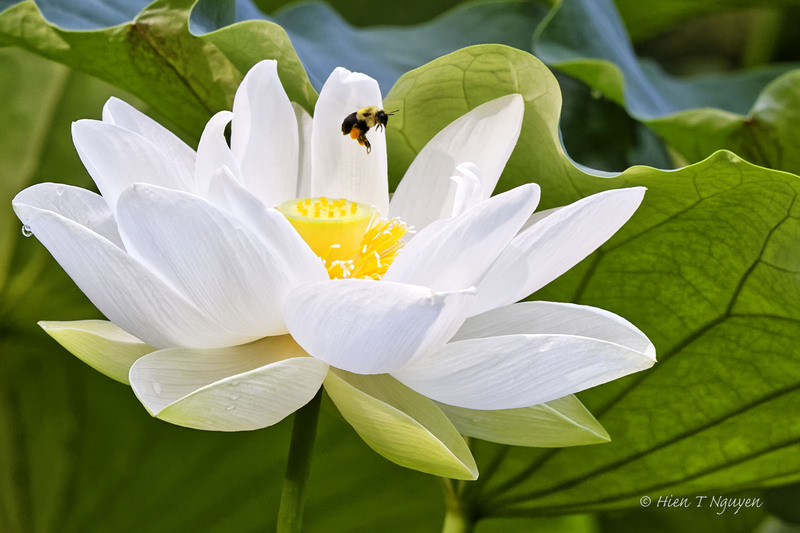 Bee taking off after getting pollen from Lotus flower. 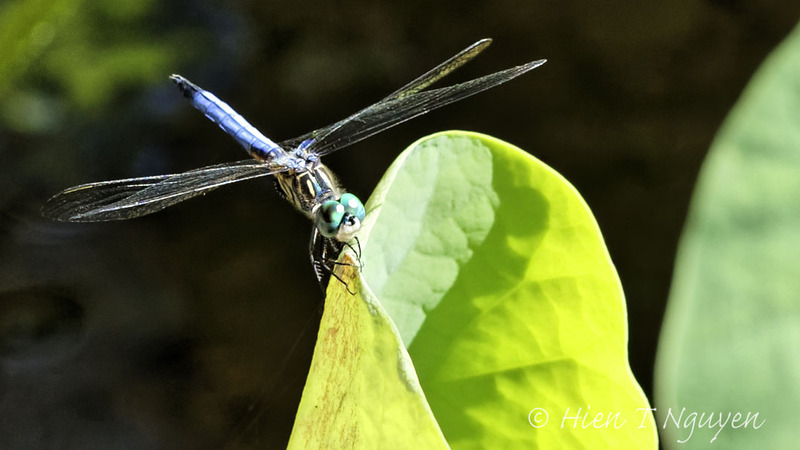 Blue Dasher dragonfly on Lotus leaf. 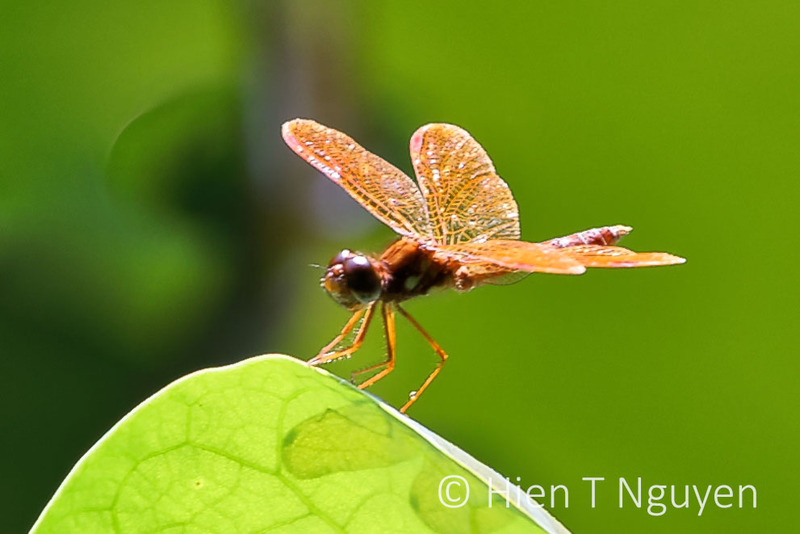 Eastern Amberwing dragonfly on Lotus leaf. 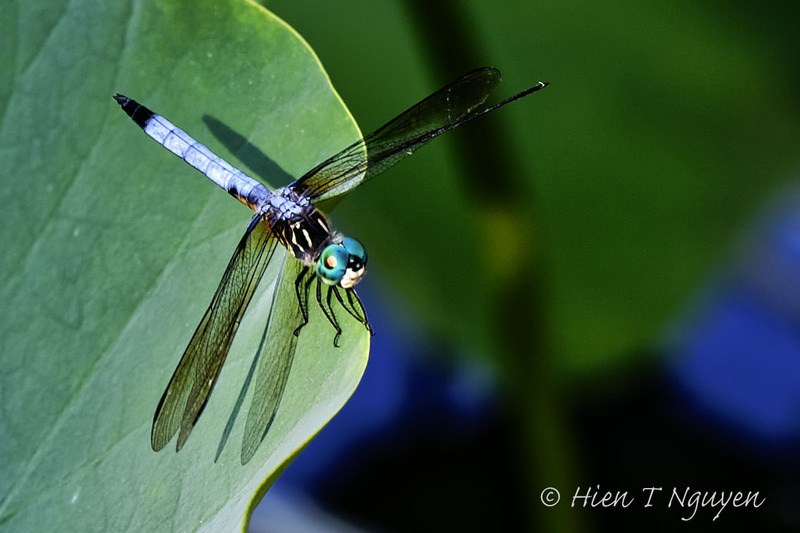 Blue Dasher on Lotus leaf.